Hello Readers, did you notice my absence in my blog for the last 3 weeks? If so, thank you for stopping by and checking. As many of you know I went to India for a short 3 weeks vacation trip. We had a fun filled vacation with all of our relatives around. Kids were pampered so much and they are totally spoiled now :). The drastic change in the weather made kids sleepy and tired for the first one week when we got there. But they coped well later. They were amused with the mosquito zapper and managed to escape with few mosquito bites. We are still getting adjusted to the time difference and I would say our schedule is still not normal yet. Jet lag takes at least 4 -5 days to settle down. Besides all when you come back, you really don't feel like cooking. 3 weeks is good enough for people like me to get lazy when you don't have to get into the kitchen to make anything. So it was a lazy start for me when I got back. Everything in my kitchen looked strange to me. We were so hooked to homemade fresh food; we didn't even want to get something from outside the day we got here. So I hesitantly got into the kitchen the next morning to start my adventures in kitchen and kick started the cooking with a Keralite breakfast. I am slowly getting back into my regular schedule now. I had mentioned in one of my previous posts that everyone in my family loves fish. So I decided to make some fish curry that my Mom makes for lunch that day. Trivandrum style fish curry in coconut gravy is something I love since I had it from my College days. My Mom makes similar fish curry. It looks little reddish orange in color opposed to the regular yellowish 'Thenga Aracha Meen curry'. I had some frozen 'Muringicka' aka 'Drum sticks' that I added to the curry and it came out really yummy. It goes very well with plain rice. Clean fish pieces with lemon juice and water and keep it aside. Wash tamarind pieces and soak them in 1/2 cup water and keep it aside. Grind all the ingredients like coconut, turmeric, shallots and water into a smooth paste. Take a medium size wide heavy bottom pan and add 2 tbsp of oil and warm. Add the chopped ginger and garlic and cook for 2 minutes. Add the chopped red onions, green chili and salt and cook it covered till the onions become translucent. Add coriander powder, chili powder, turmeric and fenugreek to it and saute till the raw smell is gone. Add cut tomatoes and drum stick and cook for 2 minutes and adjust the salt. Add the tamarind pieces with water followed by coconut paste and 2 cups of water. Use a wooden spoon to mix well. Gently arrange the fish pieces in 1 or 2 layers in the pan. Add the 2 sprigs of curry leaves to the fish and cover and cook on medium heat for 20 minutes or till the gravy thickens and slightly covers the fish pieces. In a small non-stick pan heat the 2 tsp of oil and add mustard seeds. As the mustard seeds start to splutter, add the sliced shallots, red chili and cook till it becomes light golden brown. Turn off the flame and carefully add the curry leaves. Be careful with this step as the curry leaves splutters vigorously. I usually close the pan with a lid after I add the curry leaves. Garnish the fish curry with the mustard seeds, onions and curry leaves or the tadka. You can roast the coriander and chili powder separately and grind with coconut to get a smooth gravy. The taste will also be different. Since this is a 'Pacha Thenga curry' I usually don't roast the powders and grind. Instead of drumsticks you can add green mango pieces. 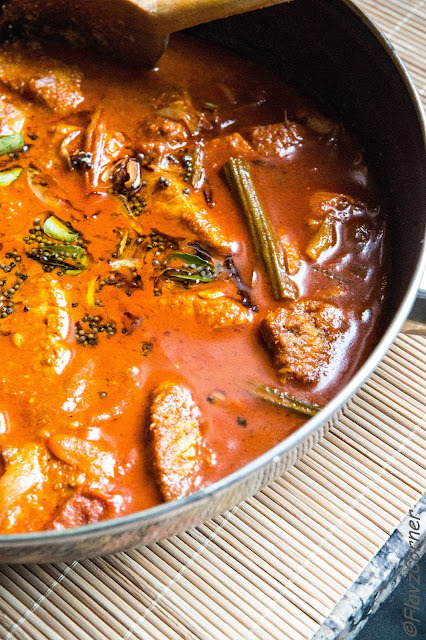 Fishes like King Fish, Mahi Mahi, Salmon etc that has more flesh can be used in this curry. 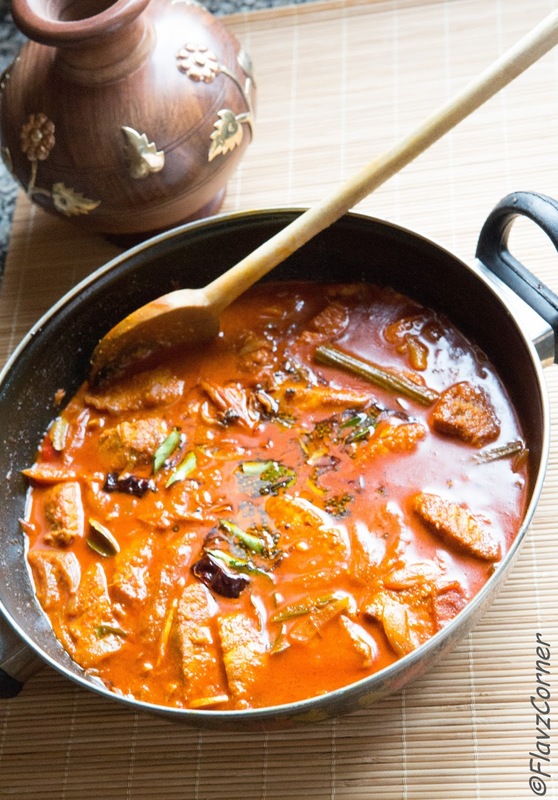 Use wide pans or earthenware pans like 'Chatti' to make fish curry. Crowded pan tends to crumble the fish pieces as you try to stir. 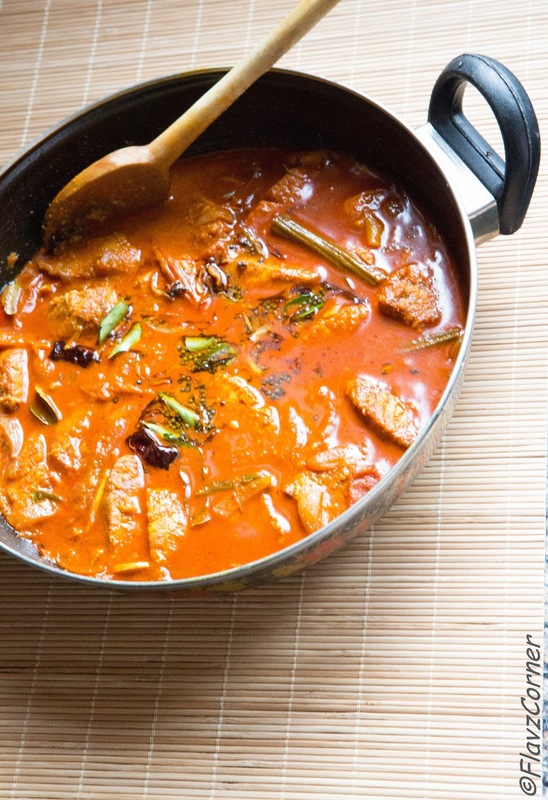 If the gravy seems to be too sour, remove the tamarind pieces from the curry. The fish tastes better after 2 hrs when all the flavors are absorbed by the fish pieces. Good one. I recently made a shrimp curry with drumsticks and posted in my blog too..